Laguna Chicabal Hike: Is it the #1 Xela Hike? Laguna Chicabal is an easy volcano to climb in preparation for Volcan Santa Maria. With a lake inside its crater, find out if it deserves to be #1 on TripAdvisor’s list of Things to Do in Quetzaltenango. If you are looking into Laguna Chicabal, and are not sure if you should pay for a tour or go independently, then we here at DIY Travel HQ can assure you that it is an easy day trip from Xela that you can do by yourself. To tackle this Xela hike, take a colectivo (Q7) from the intersection of 7a Calle and 15 Avenida (or nearby) in Xela and ask to get off at Laguna Chicabal. The vans will probably read Chile Verde, and be waiting in the opposite direction (south side) of San Martin and Laguna Chicabal. They start running at 6 am. It is possible to catch a colectivo back to Xela (Quetzaltenango) from where the colectivo drops you off. 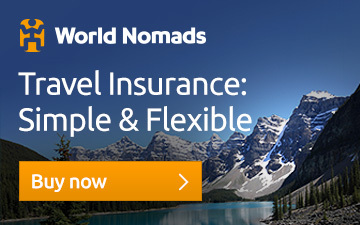 * Don’t forget to purchase travel insurance before any trip to Guatemala. We’ve been using World Nomads for over 10 years – it’s the best-value provider we’ve found but there are important things to consider. Check out our post & find out which of our claims were successful or denied. Take the 6 am colectivo if you want to arrive before clouds arrive. The colectivo will drop you off at a four-way intersection in San Martin. Your natural inclination is to go right and up, but you actually need to go left and down. This is the only confusing part of the Xela hike to Laguna Chicabal. Start the Xela hike to Laguna Chicabal by heading left and down! The rest of the hike can be followed by posted signs. Unless you aren’t paying attention, you can’t get lost the remainder of the Xela hike. Just follow the signs. In case the signs go missing, you first follow the road left and down, over two bridges, and make a left at the intersection. Make your first right where the sign indicates. Then make your first left. This road will then take you to Laguna Chicabal, and pass a Tienda on the way. Maps.me is a great offline app that shows the trail all the way to the top. View looking back over San Martin. About halfway, once you pass through the village and hike up an unpaved road, you will come across the entrance to Laguna Chicabal (Q50 / $6.45). This will be identifiable by the red corrugated roofs in the middle of farms. From there, continue heading up the unpaved road until you reach a fork in the road. You’re half way there when you see the red roofs. Your two options at the fork in the road are to visit the mirador, or head down to Laguna Chicabal’s waters. Although both options form a loop, we recommend visiting the mirador first before clouds roll in. Start the hiking loop by visiting the mirador first. Upon reaching the Laguna Chicabal mirador, it is evident that this natural attraction is not that special – there are plenty of better places to visit in Guatemala. In fact Volcan Santa Maria is the better Xela hike. There is no way of knowing you are looking at a volcanic crater lake. Unfortunately, Laguna Chicabal is an average lake that you are not allowed to swim in! Simply follow the path on the right past the mirador, and descend the plethora of stairs to the lake. Countless stairs from the lookout to the crater lake. In the early morning, the lake does offer nice reflection pictures as the water is dead calm. Come early, and witness a mirror lake. However, the highlights were watching locals pray, and seeing all the Mayan ritual offerings. Scattered around the lake perimeter were signs educating visitors on Mayan hieroglyphs. I hope you brushed up on your Mayan hieroglyphs before climbing. Several spots also featured circular rocks where candles were lit, with flowers lining the lake shore. In a conglomeration with Christianity, there was one cross placed in Laguna Chicabal. The Guatemalan Highlands are a true mix of Christianity and Mayan Pagan beliefs. On the right side of the lake was a family praying to their gods. They were on all fours, and facing away from Laguna Chicabal. It seems like locals account for the majority of visitors, as we only saw a handful of tourists on this Xela hike. I would assume locals would pray to the lake since the flowers lined the shore. To complete the loop, take the path to the left of the stairs. It is a steady climb back to the crater rim, but more enjoyable as you are closer to nature. At the top, continue following the path until you return to the Y. You should then be able to return the same way you came. This is a much nicer walk compared to the countless stairs. As I mentioned earlier, the entrance is identifiable by red corrugated roofs in the middle of farms. We arrived early, followed the road, and no one from the office bothered to stop us to pay the entrance fee. A gentleman tried to inform us to head there, but we pretended to not speak Spanish and kept on walking. Having avoided the entrance fees on the way in, we certainly didn’t want to pay them after we saw everything. Therefore, we snuck around the back of the buildings, and cut through farms to the main road. The park workers tend to stay close to the road and may not notice you. If you really want to avoid the fee on this Xela hike, it is best to take the round-about-way in both directions. Good luck! Take this farm road and cut through the fields to sneak around the entrance. Laguna Chicabal felt like a safe hike in Guatemala. The first half was through a village filled with farms and businesses. There was even a school where we saw kids racing Hula Hoops downhill. I guess Hula Hoops can be used that way too. This was followed by a more remote hike along an unpaved road. However, I feel that the entrance midway improves the security. Although isolated incidents do happen in Guatemala, I wouldn’t worry much about hiking Laguna Chicabal without a tour. There’s enough traffic on the road in the morning to add security. Why do calm places always get good reviews on TripAdvisor? Thanks for the post. We’re looking for something to do in Xela with the kids and this looks doable. Appreciate the details. Laguna Chicabal is easy to get to, and one of the more doable hikes for kids. Check out our post Xela: 5 Day Itinerary for other things to do. I would consider the weekly markets. San Francisco el Alto has a great animal market on Friday, Momostenango on Sunday combined with sandstone pinnacles, or Zunil for hot springs and finding the eccentric San Simon. Enjoy! We are sorry you weren’t able to find the collectivo to go to Laguna Chicabal, but it was accurate at the time of our visit in August 2016. We’ve had several people email us after their visit this year that they were able to get there so it might have just changed. The main thing to look for is the Chile Verde collectivo marking indicating the route. San Martin is the small village just north of Laguna Chicabal. If you were able to get there another way, let us know so we can update the article for other readers. As we travel slowly, we usually scout out our transportation options the day before. I recall it took us awhile to find the correct collectivo route, which is what inspired us to write this article and provide the Chile Verde critical detail. I believe we used our phone with Maps.me to show the drivers where we wanted to go (Laguna Chicabal and nearest town San Martin). You should ignore previous poster Alfie. The collectivo still runs very frequently as described, although it was from 16th and 6th, so they might have moved a block. To make it even easier, the drop off in San Martin now has a huge sign pointing to the downhill road to start the hike. The whole trip, including transport to and from San Martin took me no more than 6 hours. Maybe usefull to add: the collectivo costs 7 quetzal and the entrance fee has been raised to 50 quetzal. Thank you for the confirmation, and helping other DIYers. I’ve updated the colectivo and entrance prices, but did not see a 16th and 6th nearby that made sense on the map. The bus stop is at 6a Calle and 15 Avenida in Zona 3, which is probably where the previous post went wrong.